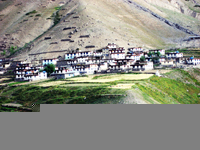 Spiti is situated at the eastern end of Himachal Pradesh, Ladakh and Tibet Border. The landscape and the lifestyles of the people of this region are similar as Tibetan and Ladakhi. The region, which is predominantly Mahayana Buddhist. Spiti has some of the oldest monasteries in the Western Himalayas, Tabo monastery being over 1000 years old. Spiti offers the trekker a limited number of treks, most of them leading out into Kullu, Manali, Leh or Kinnaur. This trek begins in Kahpnu village; it is an easy and lovely starting point through the amazing crystal clear stream river with its beautiful waterfalls, green meadow valleys towards the Bhaba pass which welcomes you to enjoy its wonderful views and many different colors of mountains and flowers. On reaching the 3950 mts high Bhaba pass you will feel great joy and also it’s the best moment to see the great views and its multi colors from the top. After the crossing of Bhaba pass, its stony valley will lead you in to the Pin and Spiti valley. You will spend two to three days of duration in Pin valley. Here you could see live Tantric shows of the Pin valley, which is well known as Mani pa (the great Tibetan Mahayana Tantric). The Tantric show can only be seen on request. In the same way you can visit many of Buddhist Monasteries and its old paintings. Gadi the traditional Indian Shepherds can be seen along the valley with their huge numbers of sheep and goats. 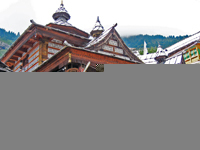 Waterfall, Tanteric, Traditional way of life, Buddhist monasteries and Paintings. You need to take waterproof clothing. The first part of the journey is done by minibus which takes you to the village of Korzok lying on the northern shores of TsoMoriri Lake. From here this trek leads towards Kibber village, which is considered to be the highest permanently inhabited village in the world. From here we drive to Kaza the capital of Spiti and after a few days exploring its beautiful valley, we continue towards Manali, crossing Kunzom La Pass.